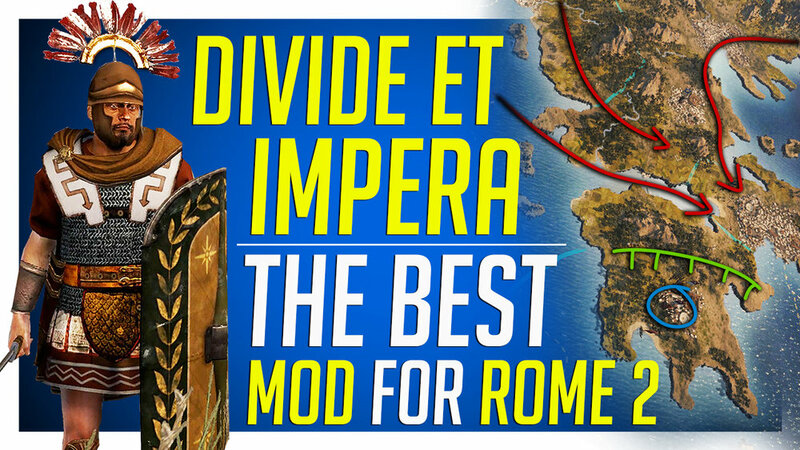 This is a quick post meant to accompany my latest video for Total War: ROME 2 - Divide Et Impera. This post will show you how to install the mod. You can use Total War Center or a hosting site. You can subscribe on the Steam Workshop. That's all you have to do. Make sure you have no other mods. Mods are all placed in the data folder, and contain both a ".png" file and a ".pack" file. Feel free to delete them. Do not delete any other ".pack files" if they don't have a ".png" with them. Subscribing to all, will download the mods in your "Data" folder where Rome 2 is installed. If you have other mods, they may cause a conflict, so on your first install, I recommend "Unsubscribing" from all mods on Steam and going to your Data folder and deleting all the mods there. To know what is and what isn't a mod, a mod will have a ".pack" file AND a ".png" file of the same name, so delete both. Steam Workshop is obviously easy, but the drawback with Steam Workshop, is the finicky Rome 2 launcher and the fact that if Creative Assembly update their game, and then Dresden updates the mod, there's a chance your campaign may break. If you roll back the patch, your mod will still no longer work, which is why I recommend TWC. Using Total War Center or a hosting site, allows you to be in control of the mod. You have the 2 files for the mod and can place them where you need, or keep them as a backup. If Creative Assembly updates Rome 2, typically then you can "roll back" the update to a previous patch to keep your mod in tact. Here's a series of discussions and guides for Divide Et Imperas features. If you have a bug or problem, post here and someone will get back to you to help usually. Each month has gotten a little better than the one before it, and in February we finally pushed out of the red and into the black! This is primarily because of the Senate we have. Around 100 people, give or take, put down their hard earned cash on Twitch or Patreon each month to directly support me and the channel. Not just that, but they give me constant feedback each month on Discord and through emails and messages, trying to help me figure out the best way to deliver my content and balance the different platforms. They push me to be better, to chase developers for access to games, to keep a better schedule and to communicate better. This monthly feedback process I believe has had a direct impact for steady growth month over month. It fluctuates depending on the month, but in March, the Senate accounted for 86% of all revenue earned for Republic Of Play. It's almost entirely fan funded. So thank you for the incredible support over the months. It's been a big learning process for me, but I think in the last couple of months we've started to hit our stride with regular videos and streams and varied content. I also want to throw a shout-out for the other content creators that also support me, either monetarily or by throwing me a host on twitch (or any of the other forms of promo!) They've been so helpful and great mentors to talk to. The response from developers has been incredible, with many of them thanking me for covering their games, even when it's not a totally glowing review. I really appreciate the developers, PR teams and CM's taking the time to respond and give a small channel a chance. And of course it's not just those who drop cash who I am thankful for. There are thousands of viewers that watch every single video, leave comments and likes, tell their freinds and link my videos around the web. The support is always incredible and I literally read every single comment. So that's it for this little update! I'm not expecting to turn a profit every month, but it was good to finally get a win, and my next goal will be to get 2 months in a row and we'll build from there!